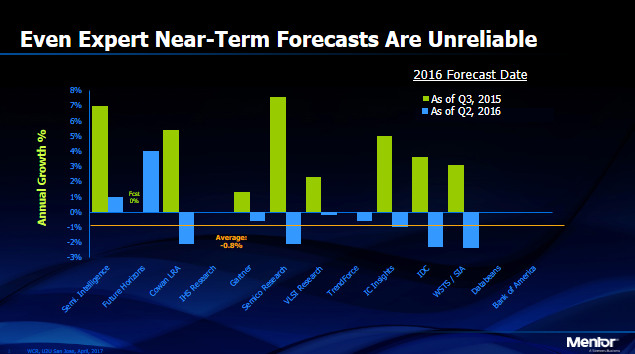 Industry-wide forecasts are tricky. Is there a better way to predict growth for individual segments? Which markets will drive semiconductor growth in the coming years and for how long are key questions that Wally Rhines, CEO of Mentor, a Siemens Business, strove to answer in a thought-provoking Mentor User2User Conference keynote here in Santa Clara, CA. To a packed auditorium Rhines described how a tried-and-true mathematical method can be applied to more accurately forecast growth and longevity in semiconductor markets such as PCs, IoT, automotive and smart phones, among others. If the mathematic model proves valid, how much life is left in some of these markets – most notably “pure electric vehicles” – is surprising. Semiconductor industry analysts and even heavily sponsored industry associations have always had a difficult time accurately forecasting semiconductor revenue, said Rhines. 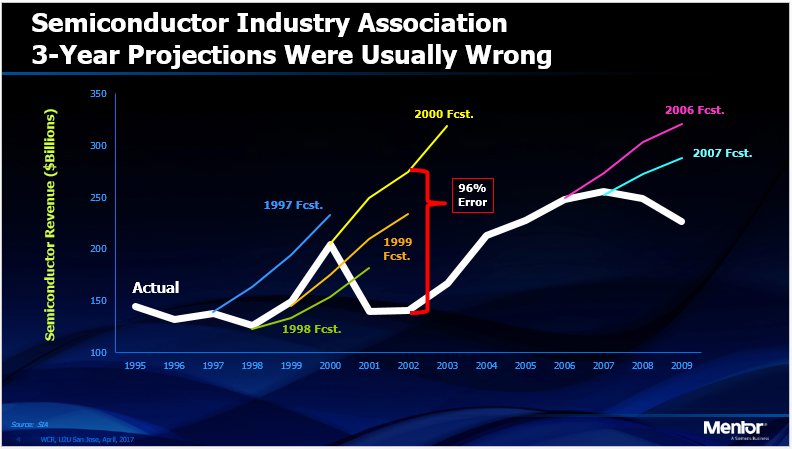 To find a prime example of this shortcoming, one need look no further than the track record of the Semiconductor Industry Association, whose predictions have been off by as much as 96% (Figure 1), though admittedly that lowest point came during the dot com bubble burst. Meanwhile, analyst predictions have fared a bit better, but tend to vary greatly and rarely hit the mark (Figure 2). By leveraging these constants, Rhines asserts that if applied through a tried and true time series mathematical model called the Gompertz Curve (invented by Benjamin Gompertz, 1825), one can draw more accurate estimates as to where particular segments of the semiconductor market are in their lifecycle in terms of unit production (and market saturation) and growth (Figure 4). One can then use this data to make more accurate predictions regarding the industry’s future revenue growth. Oversimplifying here – the Gompertz Curve is essentially a mathematic model, S-curve for time-based evolution that shows the growth for many things is fastest at the start and slowest at the end. It is applied to many fields including population growth, mobile phone uptake, market impact in finance and even the growth of tumors. To demonstrate the “Rhines model” as I will call it – how the Gompertz Curve can be applied to predicating unit volume and thus revenue of particular semiconductor segments (by multiplying volume x unit average selling price), Rhines dove a bit deeply into the solid-state imager market as an example. He said that when solid-state imager chips were first introduced in the 1970s, they were expensive, with roughly a $25 per unit average selling price. Because they were expensive, they were not used in large volume at first. But with time and more competition, the chip ASPs decreased and companies began adding them to mobile handsets as that market began to take off. Today solid-state imager ICs are commonplace in mobile devices. “Despite this roughly 90% decrease in price due to the unit volume growth of the learning curve, the actual total annual revenue of solid state imagers has grown and now constitutes almost 3.5% of all semiconductor revenue compared to nearly zero in 1990,” said Rhines. 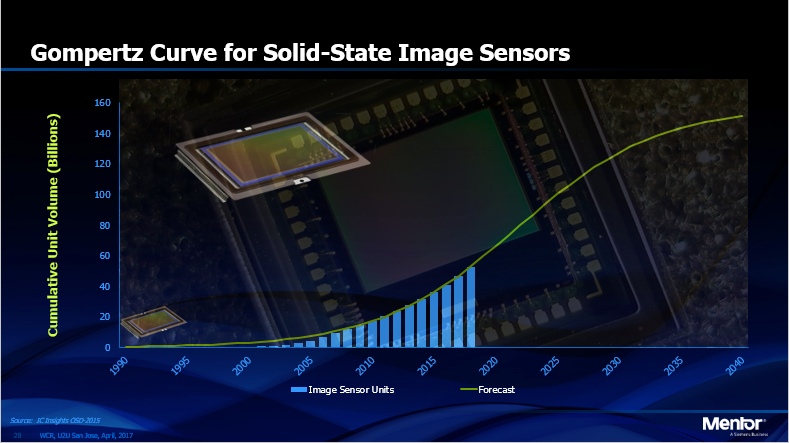 But he noted that when the unit growth progress thus far is plugged into the curve, the mathematic model indicates that the solid-state imager chips market is still in the early stages of its lifecycle (Figure 5). Rhines noted that’s likely because imagers are expanding into new markets beyond mobile phones into a growing number of vision applications such as ADAS, surveillance and medical applications. 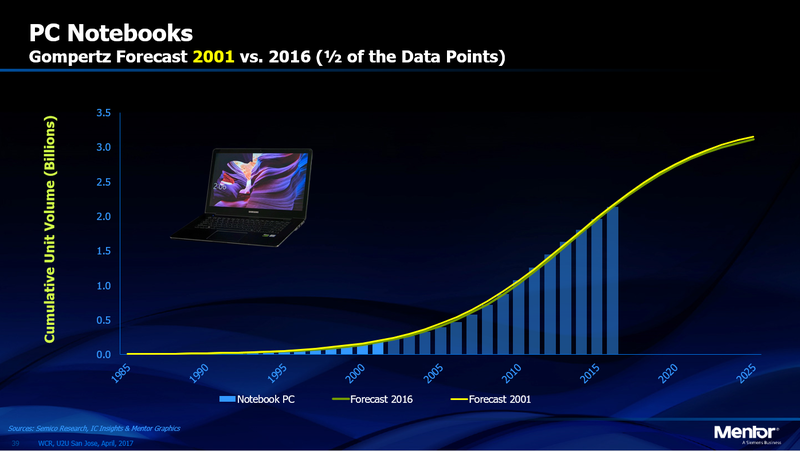 To demonstrate the accuracy of this model, Rhines experimented with the unit volume numbers for mature markets such as PC desktops, PC notebooks and cell phone subscribers. He started by plugging in the first few years’ worth of data points for each of those markets and then based only on those first few data points plotted the Gompertz S-Curve projections. He then plugged in the rest of the real unit volume data points up to 2017. The early data curves’ forecasts were in all cases remarkably close to actual unit volume numbers (Figure 6). With the accuracy confirmed, he then showed how the model could be used for forecasting. Rhines showed the audience the unit volume curves for PC Desktop shipments, PC Notebooks, cell phone subscribers, smart phones, smart meters, wearables, fitness trackers, medical wearables and set top boxes. Plotting these points and then applying the Gompertz curve shows approximately which markets have yet to achieve peak grown, which are in the midst of achieving steady growth and which have their growth days behind them. PC Desktop, Notebooks, cell phone subscribers, smart phones, internet usage and set top boxes were among the more maturing, saturated markets. Meanwhile, the smart meter, wearable, fitness tracker, and medical wearable markets have yet to reach peak growth, let alone the stages of steady growth. 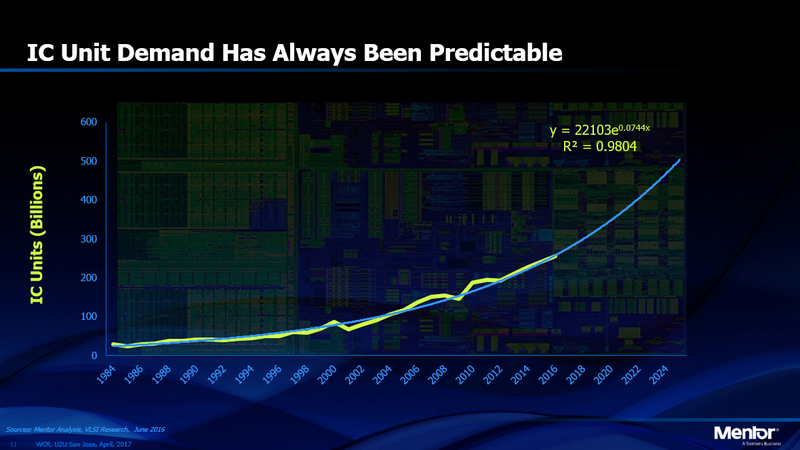 Rhines then went on to show the results of applying the curve to certain segments of the automotive market, which is widely thought of as a booming growth driver for semiconductors. Surprisingly, when unit growth for some automotive market segments – namely, “automotive night vision,” “drowsy driver monitoring” and “pure electric vehicles” – are plugged into the Gompertz Curve, the model forecasts the lifespan for those markets will be shorter than one might expect. Rhines suggested that the primary reason for this may be that automakers currently offer night vision and drowsy driving monitoring systems as relatively expensive add on options. Rhines noted that in the case of night vision, it is a system that in near future will likely be integrated into automated fusion systems, rather than offered as an option. 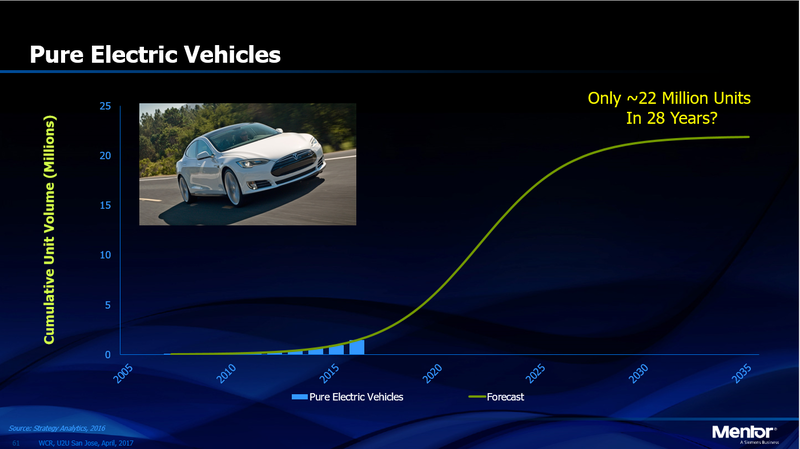 The model predicting “Pure Electric Vehicles” will be short lived – only reaching around 22 million units in 28 years – is very surprising and contradicts optimistic projections for growth of the market from practically every other forecast model in the world (Figure 7). 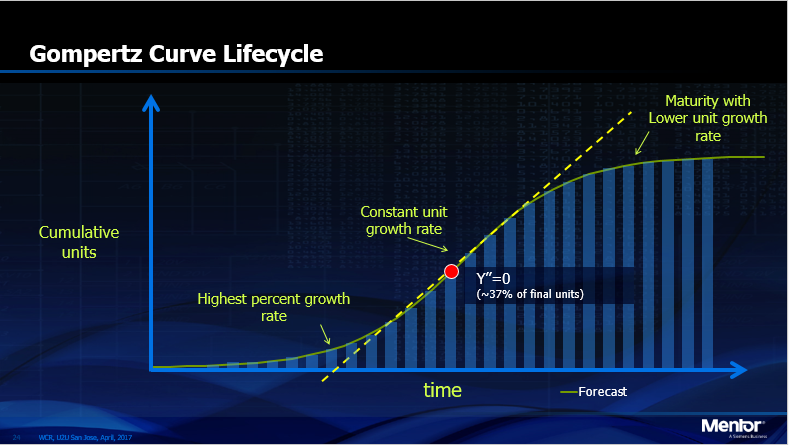 I am curious whether you (and/or Wally Rhines) see, recognize, or believe the way the Gompertz-Curve was applied to forecasting the growth of market segments relates to Hype-cycle models (defined and used by SRI and Gartner) as well as Geoffrey Moore’s Technology Adoption Life Cycle model.